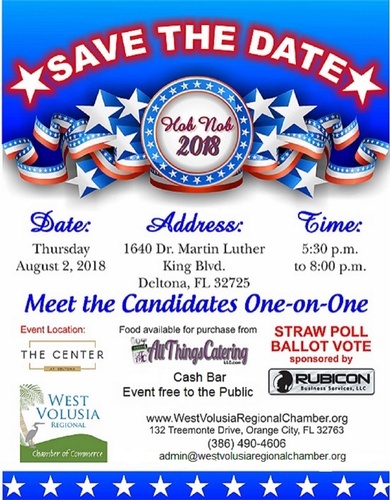 The entire West Volusia Community is invited to "Meet the Candidates" Hob Nob, presented by the Chamber's Government Affairs Committee, being held at The Center at Deltona. The Hob Nob is the perfect opportunity to meet candidates running for various local, state and federal levels of government office. A Straw Poll ballot vote, sponsored by Rubicon Business Services, LLC, will be held. The event is FREE to attend and features a cash bar and food will be available for purchase from All Things Catering, LLC. CANDIDATES: Click here to purchase table space at the event. Only candidates who have purchased a table will be able to hand out campaign materials. Businesses - Promote your business in front of the 300-400 attendees by sponsoring the event and purchasing a table! Click Here for more information!